A compact track loader is a machine that is commonly used with a variety of attachments that can perform many construction and digging jobs. It is typically used for Agriculture, Landscaping, Clearing Snow, Road Work, Construction, and Transporting Material. Compact track loaders are built on a continuous rubber track undercarriage. The rubber tracks allow this machine to work on both sensitive surfaces and poor underfoot conditions. The flat track enables it to do well in grading projects. The lift arms on the compact track loader pivots behind the cab, lifting the arms up and over the cab. This gives the machine a greater height for dumping. Tilt cylinders allow the attachment to be tilted up and down. The most common attachment is the bucket, but compact track loaders have an array of attachment options including pallet forks, grapple, mulching head, snow blade, auger, and others. Compact track loaders have a key feature that increases productivity when used correctly: high-flow hydraulics. Certain varieties of attachments benefit from running on a high-flow machine because the higher the hydraulic flow, the greater the horsepower, and the more work you can accomplish in a period of time. High-flow machines also have the added benefit of being able to run both standard- and high-floor attachments. Determine size constraints, job type, and maneuvering needs before picking a compact track loader. Vertical lift arms are your best bet if you do most of your work at eye level and above because they have better operating capacity. In contrast, if most of your work is at eye level or below, you should consider a radial lift arm machine because they get maximum bucket reach. Productivity can stall if an operator is constantly having to get in and out of a machine that is difficult to climb in and out of, so assess how often the operator will need to leave the cab and check for ease of use. Also, consider the machine’s controls and visibility once in the cab. 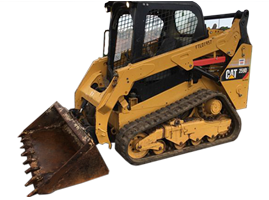 The compact track loader has many advantages and disadvantages compared to a skid steer. The tracks can be expensive to replace, so you will want to limit their use on concrete and asphalt, as those surfaces will burn through them rapidly. However, they have far greater versatility when used on wet or environmentally sensitive areas. 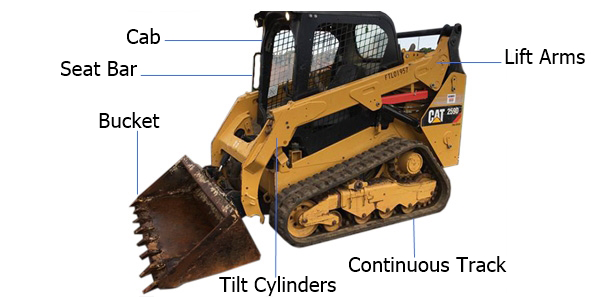 There are several popular manufacturers in the backhoe market including Bobcat, Caterpillar, CASE, Takeuchi, Terex, and John Deere.